ABC chose former ‘Bachelorette’ contestant Chris Soules to be the next Bachelor, but they skipped over the most eligible bachelor in America. Move over, Chris. 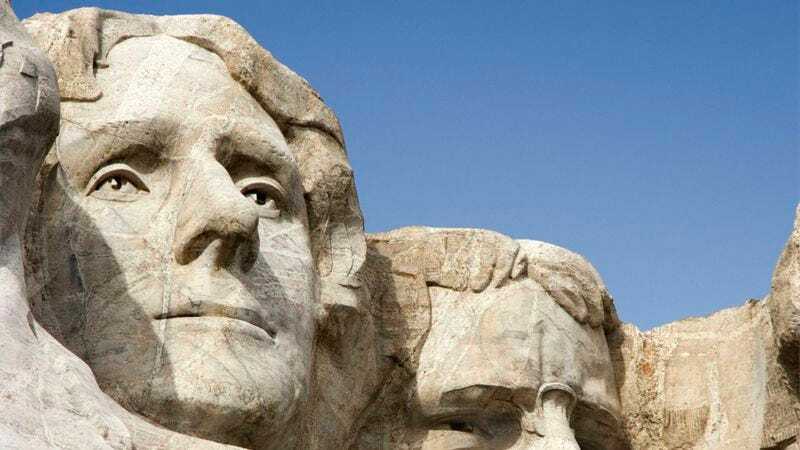 Thomas Jefferson’s Mount Rushmore head is everything a bachelor should be! 1. He’s SO handsome when he’s serious. Just imagine him giving you a rose. SWOON. 2. You can’t help but stare into his piercing gray eyes! Wouldn’t you like to cozy up with him in the hot tub? 3. He’s a rugged country boy who will show you the beauty of nature. 4. He’s got an exciting social circle, AND he stands out from the pack. 5. It doesn’t matter how close you get…he has NO flaws! 6. Calm under pressure? Check. The perfect bachelor? We think so! 7. Yep. The names that should be on everyone’s brains next season? Thomas Jefferson and Mount Rushmore. 8. Move aside, Sean Lowe. The ladies are all about TJ!